Well this week started out great as you can see. 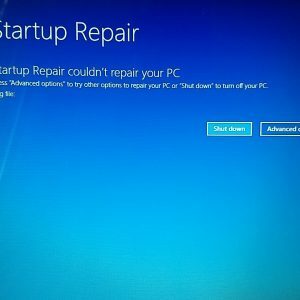 My laptop decided it would no longer boot. As the sole employee of Tipping Goat, I got to be the IT guy and ended up fixing the hard drive with command line tools, after trying to get a working DVD burner, giving up after failing to write the recovery tools to a disc, finding an older recovery disk, failing to recover, and then eventually finding the commands needed to fix the master boot record which I have no idea how got messed up in the first place. It was not how I wanted to be spending my time. Moving-related things also took up time this week, there was a lot of driving around and meeting with inspectors and such, so I was pretty frustrated with my progress on the game. After I was able to get my laptop working, I got to do some work on, and review of, the Season Mode story script. 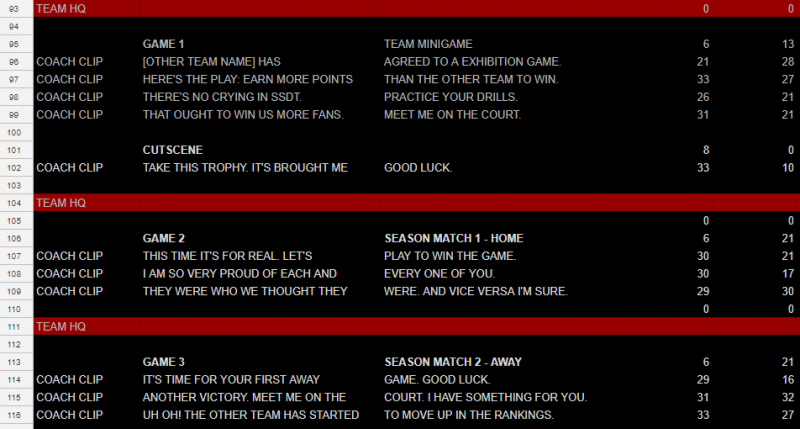 This spreadsheet breaks the simple story script into bite-sized chunks, delivered before and after each match. The text is primarily presented by Coach Cliphord via a dialog box. This box shows 2 lines of dialog at a time, each containing up to 33 characters. I use this spreadsheet to track the dialog, and make sure I don’t go over with too many characters. I can’t share the part I was actually working on because SECRET . 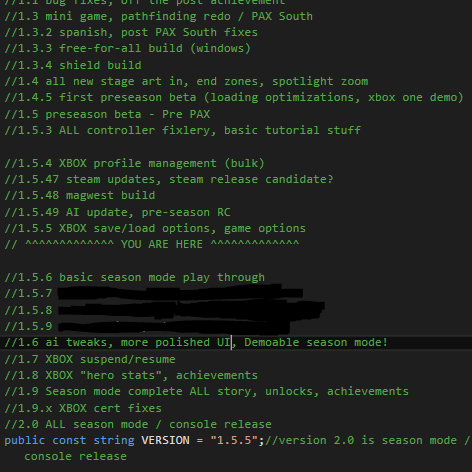 Later in the week I was able to get back in front of my desktop and do work on the Season Mode slots as promised from last week. I am now able to create 3 slots of saves, and delete them. Hooray! I know it’s not very interesting to look at, but it’s 100% really working, and that’s 50% of the battle. Or something? I still need to test on Xbox One, which I will be doing today. I know a lot of you millions upon millions of people eagerly read my dev blog to get some insight into my emotional state, because you care, very deeply. Thank you! This week I would rank my stress-o-meter at “exploding like water in the microwave that you forgot about after 4 minutes”. But after getting a few things accomplished for the move, and the game, it is now reading: “slightly better”. These are the comments in my code, right above where I set the totally non-arbitrary version number. These predictions get adjusted as time goes on, but they give me a rough timeline about where I should be and what is left to do. So in a way, the version number is a “countdown to 2.0”. Or, I guess it’s a count-up. There are some things blacked out here because of SECRET . I am just beginning the big milestone of 1.5.6 which is the very bare-bones ability to play a season against the AI teams. To get there, I’ll need to do a lot of scraping off crusty old broken code from the Team HQ screen, and tie the game schedule into a new calendar of events system. If I could devote a 40 hour week to it, I could probably get there very quickly, but with the move sucking up a lot of my time, and now two geriatric cats who need to go to the vet next week, 40 hours is not going to be available to me. So we’ll see where I am next Friday when I blog my prog… ress!